As I mentioned in a previous post, I ate at a wonderful organic vegetable and fruit centered restaurant last fall when my husband and I visited Napa Valley, Ubuntu. Since that delicious meal, I have been inspired by head Chef Jeremy Fox's Michelin-starred cuisine to create my own vegetarian dishes using the best organic fruits and vegetables that I can fine (which obviously pale in comparison to the fruits and vegetables he harvest from his organic garden in Napa). 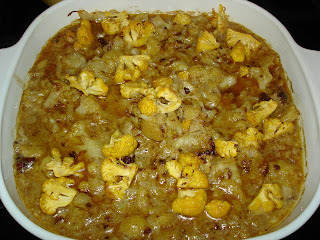 Tonight, I was inspired to create my own casserole using cauliflower based on a cauliflower casserole that is one of the signature dishes on his menu. I did take a look at his recipe for the basic outline (the cauliflour, butter, curry and whole milk), but from that point on, created my own recipe. Below is the recipe I created and adapted. Tonight was a test-run on the dish for a vegetarian dinner I will be hosting for some vegetarian friends in early January and it was a success according to my taste buds. 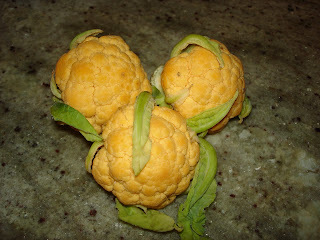 First, cut up the white cauliflower into small pieces and mix well with the olive oil and a little salt. Roast at 350 F until slightly charred and tender. Melt the butter on medium heat until foamy and then take off the heat and add all of the various spices (this was my improvised spice mix which was delicious, as the flavors mix nicely). Let sit for about 30 minutes so the flavors absorb into the butter. Add this mix to a pot with the cauliflower from the oven and add both the whole milk, the almond milk and the almond extract (sparingly). Cook on medium until completely soft. Then, bake at 350 F for about 15 minutes. The mixture should not change too much and should look almost kind of soup like when you take it out. It will have a beautiful texture. Before you bake, sprinkle some of the colored cauliflower on top. I served in bowls because I only have large souffle/casserole dishes. Ideally you would want to bake in individual casserole dishes. Put a little parsley and pepper on top and it should be delicious. 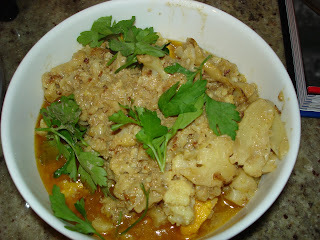 To learn more about cooking with cauliflower, click here for a dish from Amasea's kitchen in Sun Valley.